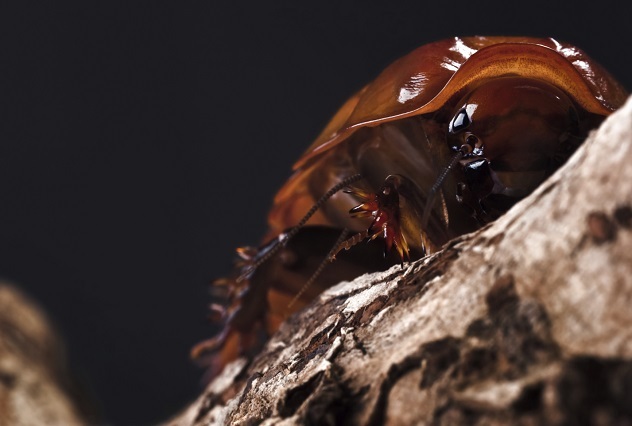 Cockroaches rank pretty high on the list of animals you don’t want to find running around your kitchen, probably just below angry bears, but cockroaches are more than just a stinking pest. You may never be happy to find that cockroaches are the new residents of your biscuit barrel, but after all, you’ve gotta make small talk with the exterminator. Here are 10 fascinating facts about cockroaches you can mention between sprays. The true risk of this sort of contest was shown in Florida. A competitor named Edward Archbold died shortly after a pet shop held a roach-eating competition with a python as a prize. He suffocated after choking on bits of cockroach that got lodged in his throat. Six Flags decided to call off their contest following the death. Of course, most people would probably never want to put cockroach anywhere near their mouths anyway. Unfortunately . . .
Did you know that there are eight insect parts in an average chocolate bar? It’s not the only food that’s full of legs and antennae. Chocolate’s best friend, peanut butter—along with cheese, popcorn, and others—also usually contain some amount of cockroach. 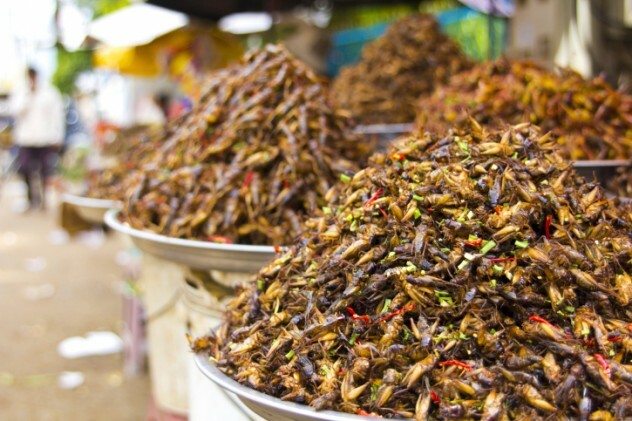 The FDA deems anything below 60 insect parts per 100 grams to be safe for human consumption. While it probably is for most people, aside from being icky, it’s been suggested that people with a chocolate allergy are actually fine with chocolate but allergic to cockroach. The contamination occurs when food is being grown. The only way to stop it would be to use a lot more pesticide, which is worse than a small contribution to your daily protein intake. There is ultimately no way to avoid swallowing a whole lot of insect, other than to stop eating completely, which may start looking like a reasonable option. 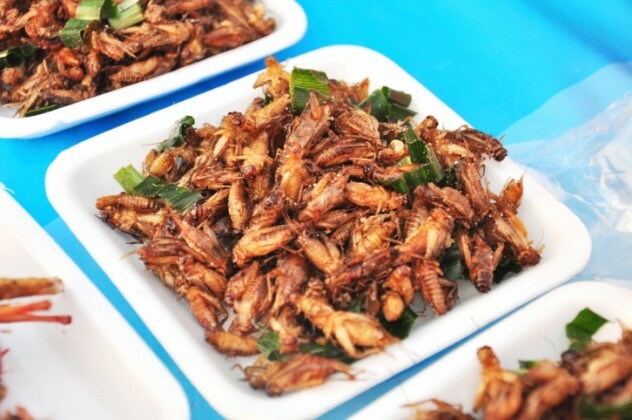 Maybe farmers should team up with the scientists that fed cockroaches with mint and vanilla. It takes many of us a few hours in the morning—as well as a big dose of caffeine—before we earn the adjective “functional.” The humble cockroach, however, takes not being a morning person to a whole new level, and not just by not being people. What really sets them apart is the fact they’re literally unable to form new memories at the start of the day. 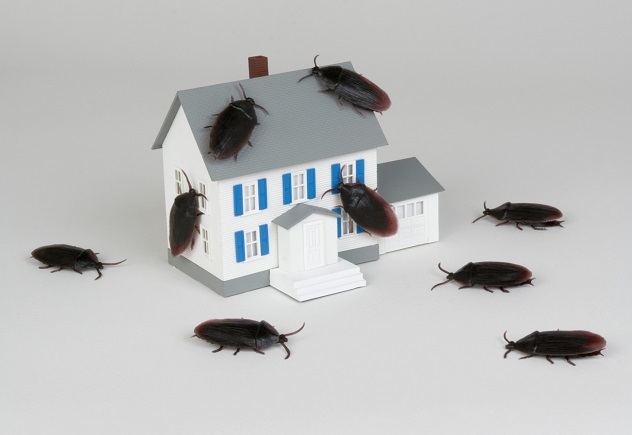 Researchers tested this by attempting to teach roaches to like bad smells. Cockroaches normally dislike peppermint but are totally down with vanilla. 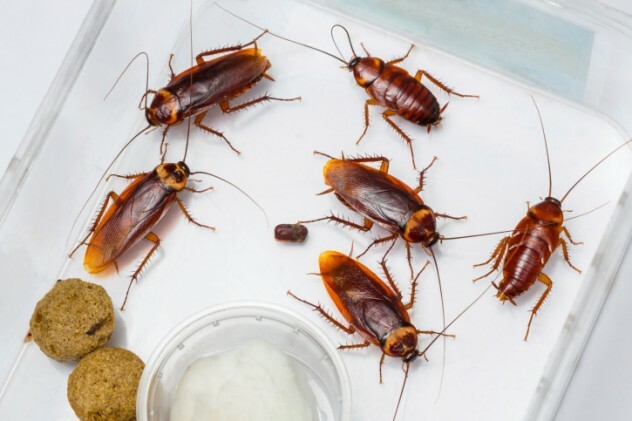 A group of researchers trained cockroaches to prefer minty freshness by combining the scent with sugar water, performing this trick at different times of the day. What they found was that in the evening and overnight, the cockroaches were perfectly able to learn that vanilla had betrayed them and mint was awesome. When the same experiment was carried out in the morning, however, they continued to prefer vanilla. The scientists don’t know why the roaches don’t have the need to pick up information that early in the day. If they were taught at their preferred hour, then they were able to remember the next morning—it’s just learning that was shut down early in the day. This sort of research helps give biologists an insight into the basic molecular working of memory. We just hope they add chocolate chip when it comes time for human trials. There’s a lot of technology inspired by nature—after all, evolution has spent billions of years solving problems that we’ve only been going at for decades. The technological field most inspired by the cockroach is robotics. The second-fastest robot with legs ever built is modeled after the insects. The “velociroach” combines two of your favorite childhood nightmares into one handy name. It also uses six legs to zoom across the room at nearly 10 kilometers per hour (6 mph), nearly twice as fast as an actual cockroach. A slower, larger robot inspired by the cockroach is the Dash. It was developed by students from Berkeley and tootles along about as quickly as the genuine article. It can fall straight down 28 meters (92 ft) and keep on going. Even better, you can buy a kit to build your own for US $65 and control it with your smartphone. They’ve even given it wings with the hope that it may one day help to find survivors in disaster zones. It’s not just the body of the cockroach that’s inspiring roboticists. Researchers from Tel Aviv are looking at how the creature’s nervous system manages its movement to figure out how to create more efficient walking in robots. In all the talk of China’s booming economy, it’s easy to miss the more unusual industries that are enjoying a surge of popularity. One of those industries is cockroach farming. From 2010 to the end of 2013, the value of dried cockroach increased tenfold. The insects are powdered to be used in traditional remedies, and cosmetic companies also buy them as a source of protein. The same things that make cockroaches so difficult to get rid of make them very easy to farm. The country’s largest farm, which contains 10 million of the critters, is housed in an old chicken coup. The roaches are kept in old egg cartons and fed vegetable waste taken from the of local restaurants. The profit margin can be as high as 650 percent. While it’s hard to imagine that devouring a ground up insect will cure cancer, as some practitioners claim, cockroaches do offer some legitimate medical potential. Scientists searching for an alternative to antibiotics have found that the nerve cells of cockroaches have the ability to kill germs. Contact with the insects’ nervous tissue was observed to kill 90 percent of MRSA and E. coli with no harmful effect on human cells. The scientists explain that it makes sense for cockroaches to evolve antimicrobial properties, given the filthy conditions they call home. Of course, having millions of insects stored in one fragile building can go horribly wrong. Over a million cockroaches escaped a farm in China when the greenhouse housing them was vandalized. The owner of the farm had invested over $15,000 setting up his operation, money he is unlikely to recover. The locals probably aren’t rallying around him, either. Residents of New York are no stranger to cockroaches, but the Big Apple does have one handy feature when it comes to fighting the beasts—it can get pretty cold in the winter. This generally drives down the roach population, but Manhattanites were faced with a new challenge when an Asian species of cockroach, Periplaneta japonica, was found living on their island. While the city’s native roaches need to stay indoors, their Asian cousins can happily survive the cold and snow. It might not be all bad news, though. The researcher that confirmed the presence of the species says that the newcomers are likely to compete with established species for the same living space and food. This means that both types of cockroach will need to commit energy to dealing with each other, leaving less time for breeding and ultimately reducing cockroach numbers. If you like the idea of a robot inspired by a cockroach, then how about an actual cockroach-turned-cyborg? Gluing a receiver onto the back of a cockroach, with electrodes inserted into the animal’s antennae, makes it possible to remotely control where they walk. It’s so accurate scientists are able to make the creatures follow a preset curved path. As with the robots, the equipment that makes this possible is available for sale to the public. The researchers behind the technology have even created a smartphone app that can be used to control the insects. Backyard Brains, the company behind the product, have been accused of causing cruelty to animals. Fitting the “backpacks” requires soaking the insect in ice water to subdue it, sanding the top of its head, cutting its antennae, and inserting the electrodes. Opponents of the technology say it encourages people to think of living creatures as nothing but tools and that using the technology with children encourages them to act like psychopaths, but scientists say that research suggests the animals feel no pain. They also foresee the possibility of doing real humanitarian good, such as the potential for use in rescue missions after earthquakes or other catastrophes. Adding a small camera or microphone would allow operators to find people trapped in otherwise inaccessible areas. Real insects have the advantage powering their own movement and reacting to dynamic environments. Humanity has yet to find cockroaches that are large enough to ride. You’ll know that’s changed because of all the screaming, but until it happens, we’re not going to get cockroach dressage or polo. That only leaves two ways to make a sport out of our least favorite house pests—make them race or make them fight. People have done both. Cockroach fighting originated in China and was introduced to the US over 100 years ago. The New York Times carried a report in 1886 of a group of Chinese people traveling around major cities and staging roach fights, bringing in thousands of dollars in bets. Considering those are 1886 dollars, that’s not bad. Cockroach racing is a more lighthearted affair. Entomology students from Maryland’s Loyola University raise and train Madagascar cockroaches each fall term. They give them sporting nicknames like Green Machine, then pit them against one another in sprint and endurance events. Roach racing has also become a regular charity event at a pub in Brisbane, Australia. The race has been going on for three decades and raises money for local causes. Russia’s capital city has had an unusual few years when it comes to cockroaches. Back in 2008, it was reported that infestations had fallen significantly since the start of the decade. When government officials tried to find 54 cockroaches to send into space, it took them three months. A Russian entomologist called for some species to be classed as endangered and for a colony to be set up at a zoo. People blamed everything from cell tower radiation to genetically modified food, but a much more plausible explanation is simply that the city’s building standards were improving. Scientists had yet to figure out exactly where the cockroaches had gone when the creatures returned in 2011. Their numbers didn’t just start increasing—the resurgence was described as a “plague.” Scientists had expected the insects would bounce back if they developed a resistance to insecticides being used by residents, but were shocked by the sudden flood. Maybe China isn’t the only country with makeshift cockroach farms? One of the most interesting windows into the world of tens of millions of years ago comes from ancient insects preserved in amber. While DNA doesn’t survive long enough to allow us to clone dinosaurs like they did in Jurassic Park, other organic material does stand the test of time. Slovakian researcher Peter Vršanský and his team were using x-rays to create a 3-D model of an ancient cockroach when they found chunks of wood that were larger than they expected. The chunks were also smoother and more digested than the cockroach could’ve made them. The only source of these bits of wood the scientists know of is dinosaur poop, suggesting that the cockroaches had an unusual diet. There’s an interesting story not only in the poop that long-extinct cockroaches ate, but also in what modern cockroaches do with their own feces. 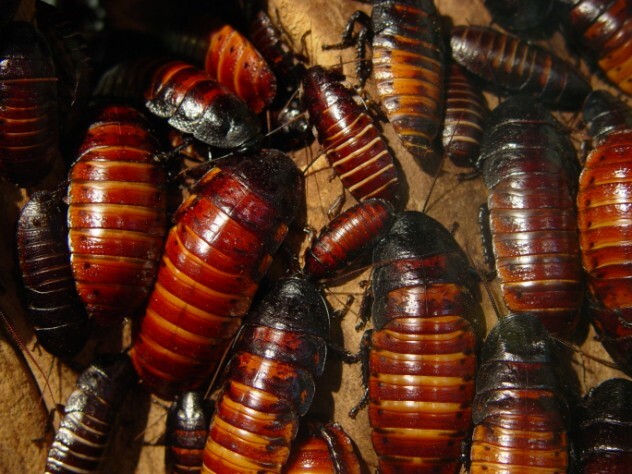 Wood cockroaches are a species that nest in rotten trees and cover their homes with their own waste. This prevents the growth of harmful fungus and may explain how termites developed their social structure. DNA analysis has shown that termites evolved from cockroaches. Other insects that live in colonies, like ants and bees, have genetics that favor this arrangement. Termites don’t, so it’s a mystery why they developed colony living. The researcher that discovered the anti-fungal property of cockroach poop suggests they got together so they could pool their feces in order to improve their level of protection from fungus. One of the rarest cockroaches in the world is also one of the most fascinating. Luchihormetica luckae is known from a single specimen collected in Ecuador in 1939. The area in which it was found has been devastated by a nearby volcano, so if the roach hasn’t gone extinct, it can’t be far off. In fact, scientists think trying to collect another sample could tip it over the edge. L. luckae is one of the few land animals that glows. Its markings are the same as the bioluminescent click beetle, which is toxic. 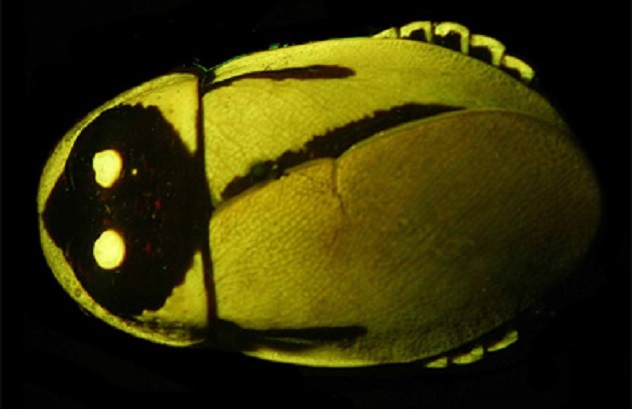 Analysis has even shown the frequency of light produced by each creature is the same, so the cockroach enjoys the same protection from predators as the beetle. It’s the only known example of mimicry in nature using bioluminescence, making it a particular shame that the animal may now be gone. Alan considers the presence of insect parts insignificant compared to the deliciousness of chocolate and has no plans to reduce his intake. He is also very tempted to move to China to make his fortune in the world of entomological agriculture.